Over the past 50 years in particular, fear of woodworm and other insect larvae has resulted in the creation of a multimillion pound industry providing remedial treatments to timbers. However, the insecticides used in the past were not only toxic to insects, but were also generally more or less poisonous to other organisms, including human beings, as well as being damaging to the environment. The chemicals or combinations of chemicals used represent a potted history of the chemical industry, starting with the use of arsenicals at the start of the 20th century and moving through to the more general use of organochlorides such as DDT, dieldrin, eldrin, gamma benzene hexachloride and lindane, followed by the introduction of organophosphates derived from research on chemical warfare agents. The potential hazards of some of the early treatments such as arsenical smokes and more recent vapour treatments such as phosphine, ethylene oxide and methyl bromide, were generally recognised and as a result ‘safer’ alternatives were sought. The environmental hazards associated with organochloride materials such as DDT were also recognised in the later 20th century. As a result, some effort was made to develop and use chemicals which were more specific poisons or less toxic to human beings, at least in the short term. This resulted in the introduction of permethrinbased insecticides. However, all these chemicals are potentially hazardous, especially to individuals who are sensitive to them. The situation was often made more complicated by the use of mixed chemical remedial treatments intended to control both insects and fungal decay. Many supposed woodworm infections were treated with potentially highly toxic cocktails of solvents, fungicides and insecticides on the‘precautionary principle’. It should also be remembered that, at the time of application, those applying these chemical remedial treatments were often convinced of their general safety, and worked on the principle that if a little insecticide was good, then a lot must be even better. Similarly, those who had been in the industry for some years were often unconvinced of the toxicity or potential hazards of materials they had used freely in the past, and therefore had no concerns about using up old stocks of chemicals which, under more recent health and safety regulations, would otherwise need to be disposed of as hazardous waste. Using up mixed cocktails of superseded chemical remedial treatments was often allowed by special provisions in new health and safety regulations. Liquid solutions of chemical treatments intended to control woodworm infection and decay were generally applied by spray or brush application and therefore often contaminated other materials nearby, particularly porous insulation materials and accumulations of debris and dust. 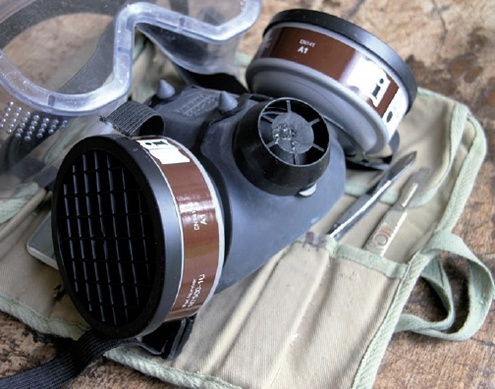 Although the chemicals used in this way in the past may have decomposed or dissipated into the environment, it is usually possible to detect significant levels of the compounds used in previous chemical remedial treatments, their contaminants or decay residues, in the dust and debris of treated buildings. These may represent a potential irritant or health hazard to occupants or those working in these structures. Indeed, it is not unusual for surveyors and others who routinely come into contact with previously treated areas to have become sensitised to some of these materials, resulting in symptoms such as runny or dry eyes, respiratory irritation and dermatitis on exposed skin such as hands and wrists. The residues of previous chemical treatments carried out in an attempt to control or prevent woodworm or other decay organisms in the UK may therefore represent a latent problem potentially affecting the health of occupants and the health and safety of those working on previously treated structures. In the future, toxic residues from previous treatments for Anobium punctatum or other decay organisms may affect the capital value of the buildings. The situation is therefore similar to that resulting from asbestos residues in buildings. Similarly inappropriate specification of remedial works may leave those involved liable under CDM (Construction, Design and Management) regulations. Those responsible for buildings in the UK should therefore take all reasonable measures to identify and control the potential risks from residues of previous chemical remedial treatments to control woodworm and other decay organisms. This should include management measures such as specialist independent survey and testing, recording, encapsulation, and safe removal and disposal of these materials in accordance with current regulatory requirements, in the same way that asbestos residues within buildings are controlled under the Control of Asbestos Regulations 2006. TIM HUTTON MA MSc VetMB MRCVS is a building pathologist and environmental scientist, and the managing director of Hutton & Rostron Environmental Investigations Limited.